Lamb cake is one good thing that came out of the B days. 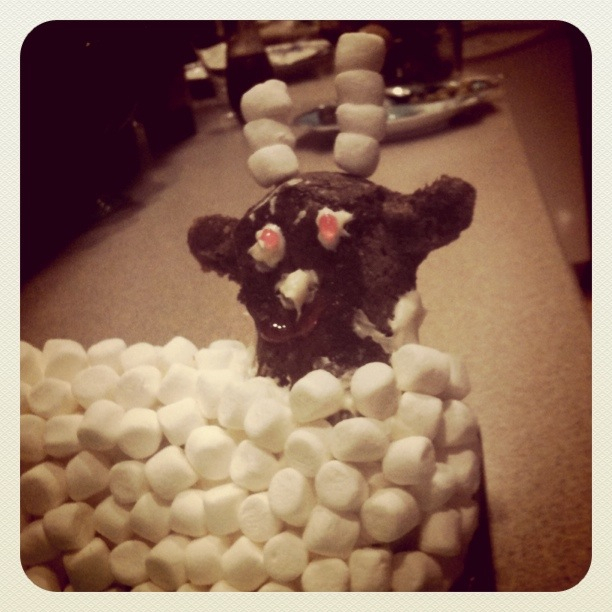 My brother R and his wife started inviting L and B for Easter a few years ago, and they started bringing a lamb cake. The first year L got a fancy one from a bakery, all fluffy and perfect. But she left it in the car while she was at work and it froze, and all the buttercream frosting shrunk. So when it thawed, it tasted good but looked like a wizened, ancient lamb. Was B out of the picture after that first year? Or was it the next? I don’t remember. Like the lamb cake his fluffy good nature hardened and staled, and today he graces someone else’s table. Probably in a diner and complaining about the service. Single again, L started making her own lamb cakes. She found a mold, I think of her mom’s, a smallish, upright lamb. Very English. Very delicious but the head kept falling off. So when she served it the first year, the head had to be displayed separately. R’s wife froze the head and hid it in our freezer at Thanksgiving. I passed it on to L’s freezer sometime after Christmas. This year L made two lamb cakes, using that same mold. One regular yellow cake and one chocolate-zucchini. The yellow head had stayed on, but the chocolate-zucchini head fell off. L solved this by sticking it on with skewers which she decorated with mini-marshmallows, so they looked like fluffy antennae. The lambs lay on a bed of green coconut grass and gazed at each other. It was hard to decide which one was uglier. Both bodies were perfectly molded; it was their faces, where L had only her cake-decorating tubes and imagination to work with, that things went so Halloween. The white one – actually, they were both white because the chocolate one was covered in mini-marshmallows – the yellow cake one looked drunk, while the chocolate-zucchini one had more of a stricken, please-don’t-eat-me, I’m-new-to-this-planet expression. They were the perfect centerpiece for post dinner discussion about weird religious bits that no one really talks about. Why didn’t anyone recognize Jesus when he came back from the dead? If you believe that, is it an argument for reincarnation? And what exactly happened between those few recognition moments and His ascension into Heaven? Shouldn’t there have been some kind of festivities, gatherings, sermons-on-the-mount where He could be like, I’m back, now do you believe me? No, He just sort of faded up to Heaven. L said she’d called our Auntie M this year for advice on decorating the lamb cakes. Auntie M said the lamb should wear a blue collar, that there was some religious significance to that but she couldn’t remember what it was. L didn’t have a blue decorating tube so her lambs are collarless. Like Jesus and B, they’re free. Except they’re made out of cake, so actually the rest of the chocolate-zucchini one is in my fridge and I’m going to eat some right now. Unless some Martian-lamb miracle has occurred and this is just a verse in someone else’s bible. That would either be really bloody or really delicious. We had so many people for Easter dinner when I was a kid, my mother had two lamb cake molds. White Duncan Hines cake mix, white marshmallow icing and coconut for the fleece, with 2 licorice jelly beans for the eyes. Now that I’m an adult, it’s feast or famine. Last year we had ten people for Easter (too many to seat them all, so we went out). This year, we invited seven and one came (but he sang a lovely Baptist hymn a capella). And I bought cherry cheese streussel from the Hungarian bakery instead. I hope you cut it into a lamp shape, at least.